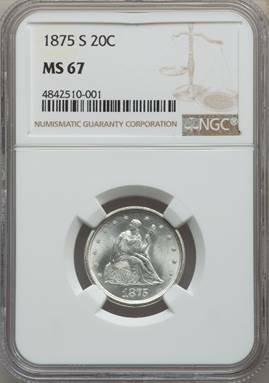 The twenty cent denomination is one of the great failures in American numismatics. There was never any great need for it. Its use was limited to the West, where consumers would often pay a quarter for items worth a bit (one reale, or 12.5 cents) and receive a dime back in change. Copper did not circulate in the Pacific states, so consumers were often shortchanged by two cents. The twenty cent denomination was suggested by Nevada Senator John P. Jones as a way of solving that problem. It never caught on, and the denomination was abandoned for circulation in 1876, one year after it was first introduced. 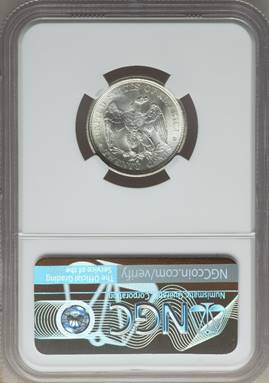 The 1875-S is the most plentiful issue in the short-lived series, claiming a mintage of 1.1 million coins. The NGC census stands at just 8 with 1 higher. Listed at $24,200 in both the CDN CPG and NGC price guide.